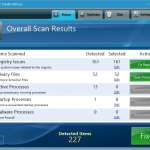 ParetoLogic PC Health Advisor is an all-in-one computer optimization and maintenance suite you can rely on for smooth system performance and malware protection. When a computer begins acting up or even slows down to a crawl, the fix may take a variety of things to look at and address, but the main possible causes are definitely in the realm of operating system optimization and malware removal. 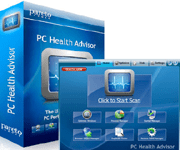 PC Health Advisor by ParetoLogic is a reputable tool that incorporates thorough system diagnostics, advanced performance improvement and security features making it a great pick for both emergency technical problems and the regular everyday maintenance. One of the critical areas of expertise covered by this utility is computer speed optimization through managing startup objects, defragmenting drive volumes, and cleaning up the registry – these ensure smooth Windows launch, faster operation and a higher overall responsiveness of the OS. The hurdle of hardware getting unstable because of outdated drivers gets out of the way due to the benefits provided by the app’s Driver Manager feature, which flags the old stuff and helps find the new. Whenever a file won’t open, the File Extension Manager goes online and finds the appropriate program to get the job done for you. Additionally, junk and temporary files, recent history, Internet cache and other redundant things clogging up the memory get accurately identified and cleaned up in a few clicks. To its further credit, not only does PC Health Advisor deploy optimization proper – some of its features allow killing two birds with one stone, delivering a fair degree of security and privacy protection. 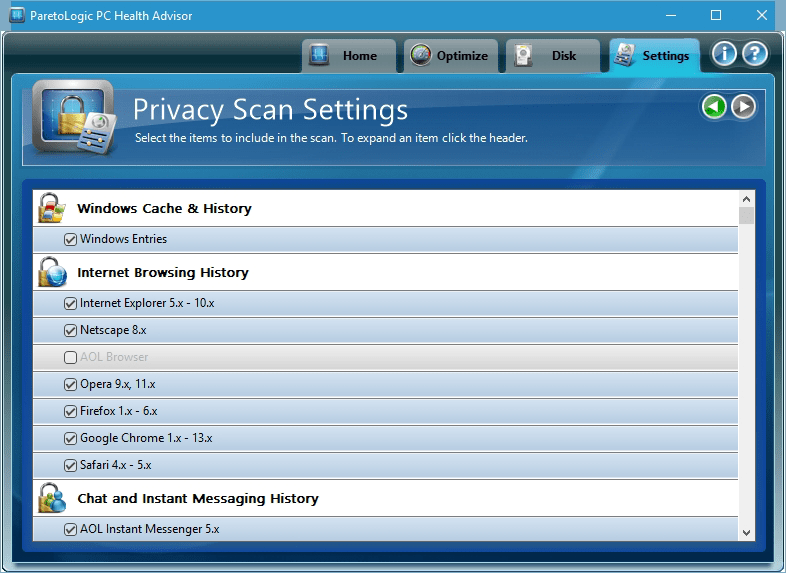 The suite monitors running processes and easily terminates malicious ones. Potentially unwanted browser helper objects can be disabled as well, even persistent ones such as adware that do not yield to the standard manual elimination routine. Do not fail to read the rest of this review to get a better idea of the benefits and downsides of this program as well as its usability and efficiency benchmarks. 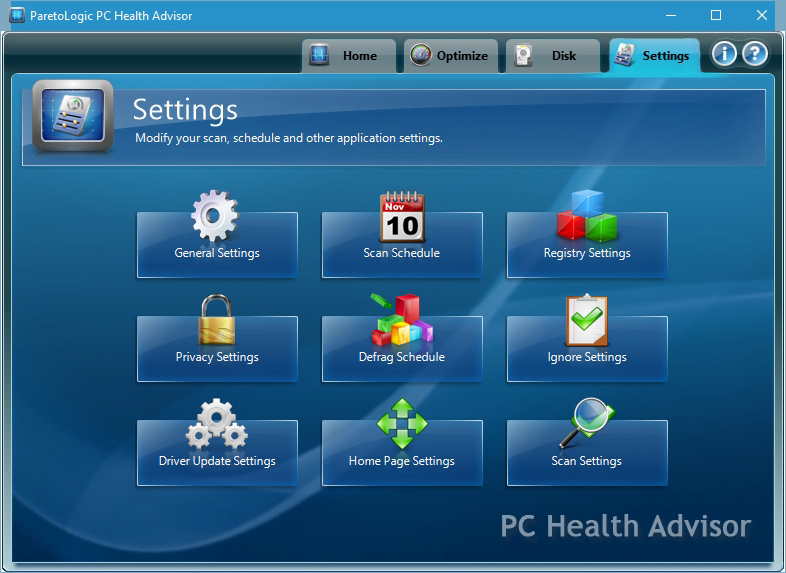 It shouldn’t take more than a minute to install PC Health Advisor as the application is amazingly simple and light in this regard. As few as five clicks – and you’re good to go. The setup requires downloading and launching the 5.7 MB installer, agreeing to the License Agreement terms, selecting the components to install, and selecting the destination folder – pretty standard stuff. In fact, the program suggests a default preset for some of the above parameters that you can leave unaltered if it’s okay with you. A total of 10 languages are available for the latest build of the suite, including German, French, Italian, Spanish, Portuguese, Danish, Norwegian, Swedish and Dutch. The product is Windows 10 compatible. 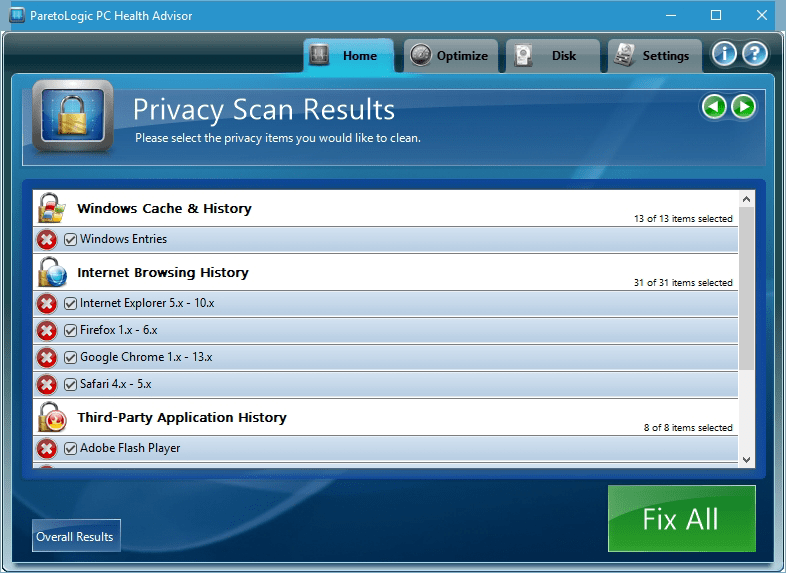 The install is immediately followed by an automatic scan analyzing the registry, processes and privacy of the machine. After an about one-minute wait, you get the results listing the detected registry problems, malware processes, sensitive files that may get your privacy compromised, and startup processes which can be disabled for faster Windows boot. We got 227 detected items. What it then takes to repair and optimize is click on the Fix All button down at the bottom or select the appropriate action for a standalone troubleshooting area. The simplicity of this whole process is commendable. 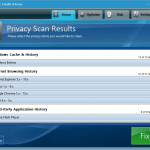 Unfortunately, unless you purchase the license, the free version is a scan-only tool. Besides the actual fixing capacity, paid version users can enjoy additional privileges such as Premium Support. 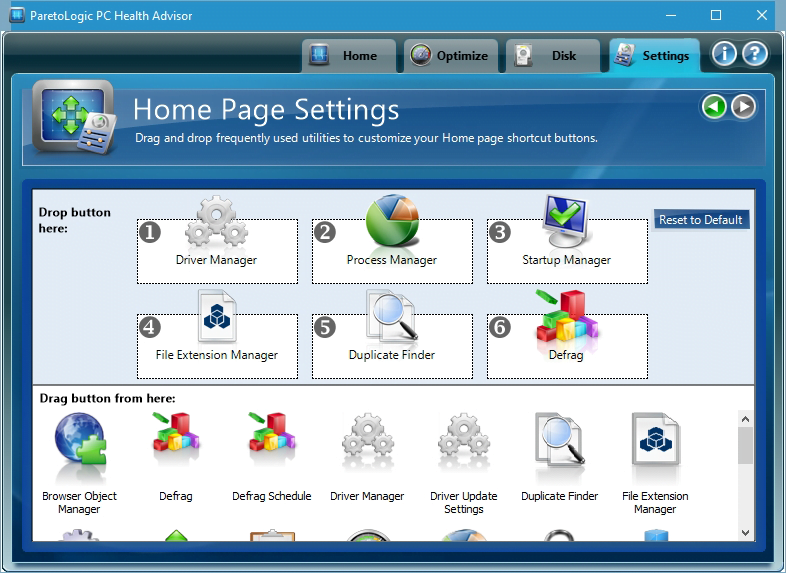 The interface of PC Health Advisor is nothing out of the ordinary, providing a fairly easy access to the program’s features and settings. It’s got a total of four main tabs lined up in the upper part: Home, Optimize, Disk, and Settings. One thing that may appear confusing to some is the navigation within tabs – it’s doable with two little left and right pointing arrows in the top right-hand part of the GUI. It’s fine actually, but the problem is, as long as you are clicking those back and forth when viewing different sub-sections of the scan results (overall, registry, processes, and privacy files reports), the rest of the main tabs aren’t active and therefore can’t be opened. It’s not until you either choose the Fix All option or click Cancel there that the other tabs become accessible. But generally, the user interface is intuitive and not redundant in any way, listing all features as standalone rectangular boxes that expand when clicked on – then the navigation is a matter of clicking the above-mentioned arrows. The impression from using this utility is generally pleasurable rather than blurred. It’s speedy, responsive and user-friendly. A particularly attractive and handy thing is the ability to customize the home page by dragging and dropping the icons for individual features through the Home Page Settings pane – that’s something other vendors should take after. The Malware Protection module built into PCHA is moving to the forefront as the security stakes are growing these days. Ransomware, the new buzzword in the contemporary threat landscape, poses a huge risk to victims because it encrypts their personal data and extorts money for recovery. The suite being reviewed is on the lookout for malicious code like that as it monitors active processes in real time. Furthermore, it boasts a large database of malware processes that’s regularly updated to identify the latest virus strains. Process Manager is a functionality allowing the user to view all processes currently running on the computer, the memory consumed by each, description, information on whether they are signed or not, and the path where they are located in the system. From this single place any non-critical processes can be ended, including the ones that won’t terminate from the native Windows Task Manager. Startup Manager delivers a complete profile of all the executables launched when Windows is booted up. These processes are grouped by system items, user installed items, and others. You can deselect redundant objects here, thus tuning up the speed of operating system startup. Driver Manager scans the machine for outdated drivers, lines those up in a list and provides the possibility of downloading their latest versions without having to go to support web pages for each individual hardware component. With the File Extension Manager feature, you can enter the extension name (e.g. docx, jpg, wma, etc.) and get a full description thereof along with a list of software that can be used to open the file of interest. For each program, PC Health Advisor provides a user rating, information on whether it’s free or paid, as well as links to learn more and download. File Extension Manager will also pop up automatically whenever you try to open an arbitrary file that you do not currently have the appropriate program for. Browser Object Manager informs you of the web browser extensions, toolbars and other add-on types installed. To a large extent, this feature performs a security function because it lets you easily disable unwanted browser helper objects, including adware-related ones which are usually too persistent to be uninstalled manually via native browser settings. Restore Point Manager basically replaces its Windows counterpart, making it simple to restore the system to its previous state or roll back critical OS updates if they resulted in malfunctions. This feature also allows creating new restore points at any time. Through the use of the Defrag feature, you can get your HDD volumes analyzed for scattered data clusters and then defragmented. Additionally, the Defrag interface displays information on the format of the volumes, their total size, free and used space, so it also serves as sort of an aggregate of the hard drive stats. Duplicate Finder looks for copies of the same file or folder in different places on the PC. You can therefore free some disk space by deleting the files that shouldn’t be where they currently are. Temporary files and recent history cleanup makes the respective tasks a one-click experience. 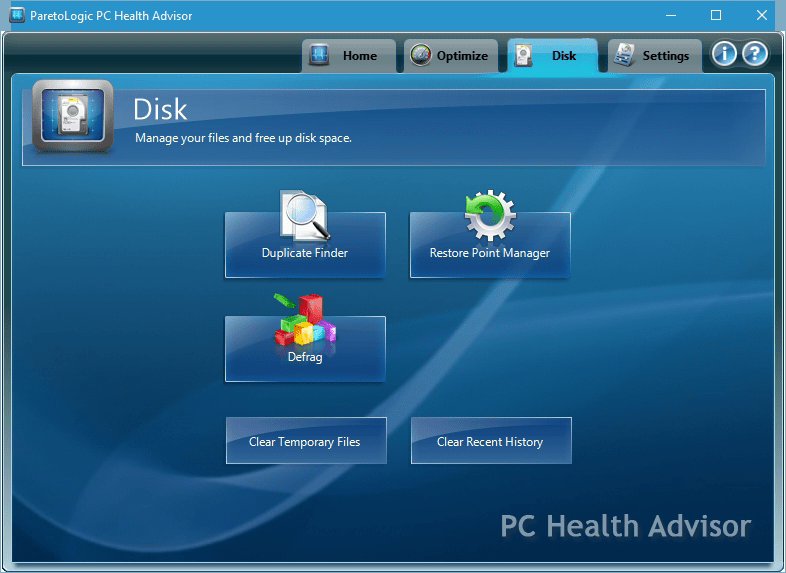 By utilizing these features, you can save yet more disk space and hence get the PC running faster and smoother. Scheduling system scans and defrag activities is another benefit at the user’s fingertips. 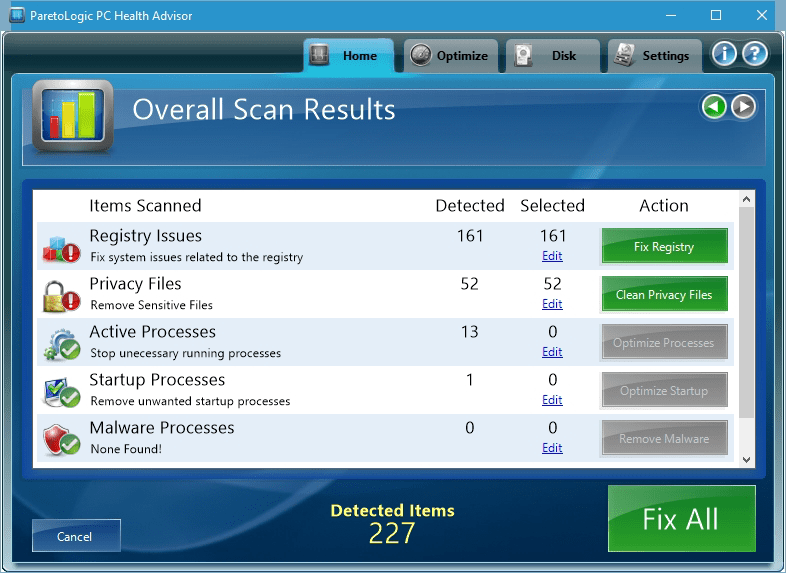 By default the system gets defragmented once a week and scans are triggered twice a week. These settings are easily customizable. Home Page Settings is a must-mention feature which makes it possible to define which buttons are displayed under the Home tab. Doing this is extremely easy: just open up the Home Page Settings screen under Settings, then drag and drop the icons for the features that should be represented on the Home tab. 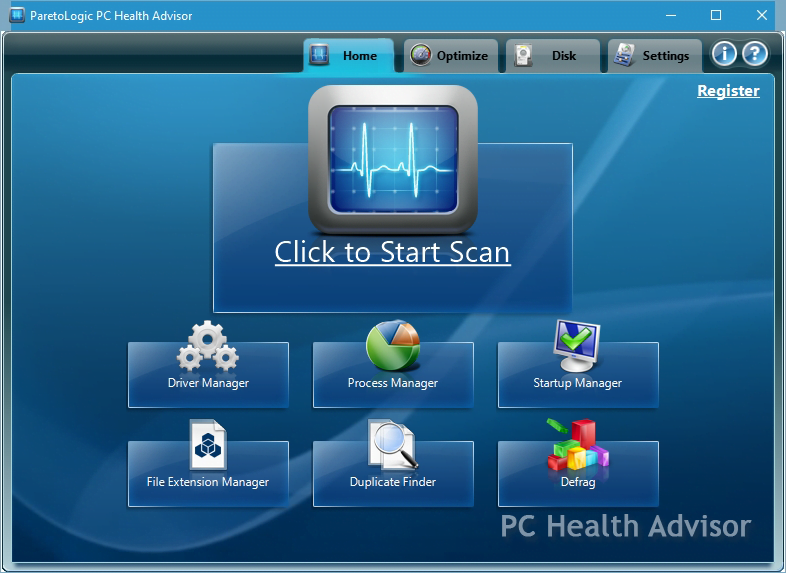 PC Health Advisor worked generally smooth and trouble-free throughout the Soft2Secure test. Whereas some of its features such as the Process Manager, Startup Manager and Defrag have their counterparts that go with Windows, we found the utility more scrupulous and accurate. For instance, the suite goes more thorough in performing the Defrag task than the dedicated operating system functionality: in our case, it identified 68% fragmented data within D volume, while the system utility kept saying there’s none. Furthermore, this program exhibits a clear-cut capacity to help handle malicious software. The Process Manager can be used to effectively kill malware executables while attempts to do so via Windows Task Manager can fail due to the persistence of some cyber threats. The same applies to the Browser Object Manager which can be used to eliminate adware items in scenarios where manual deletion is to no avail. The application also does a commendable job raising red flags on file-encrypting ransomware. 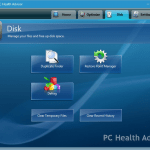 PC Health Advisor users have at their disposal a pretty standard choice of support options which should suffice to resolve issues of any complexity. To begin with, the program’s interface proper has got a built-in question mark icon linking to an online user guide. The Salesforce Desk-powered ParetoLogic Support Center contains more in-depth information, providing the Q&A search possibility as well as the option to shoot an email to the tech team. The tickets are responded within 24 hours, but it usually takes a lot less time for the experts to get back to you. The support hotline phone number is toll free for U.S. based customers, with the following working hours: 8am-4pm PST. It used to be hard to find, but the vendor has obviously addressed user feedback and now provides the number on the support web page as well as the product GUI itself. 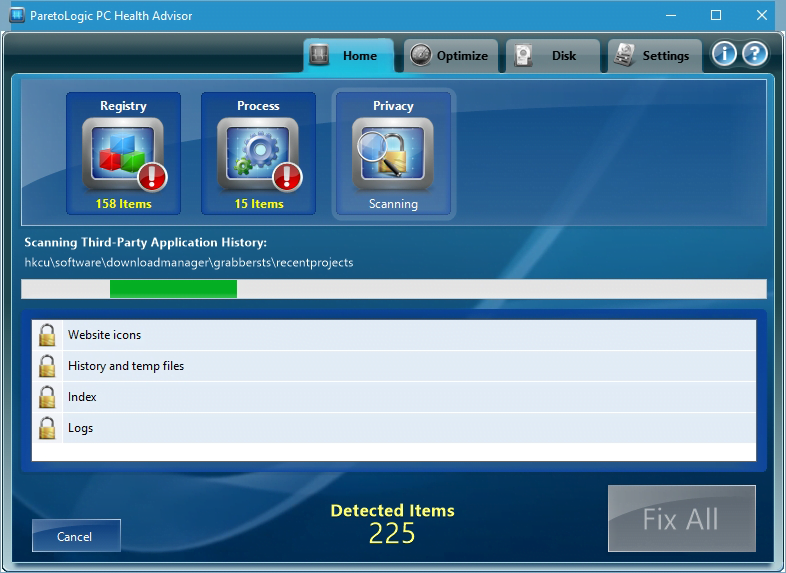 ParetoLogic PC Health Advisor makes computer maintenance an easy and highly intuitive process. Usability-wise, this tool doesn’t take much effort to browse through and manage, moreover the controls are customizable. 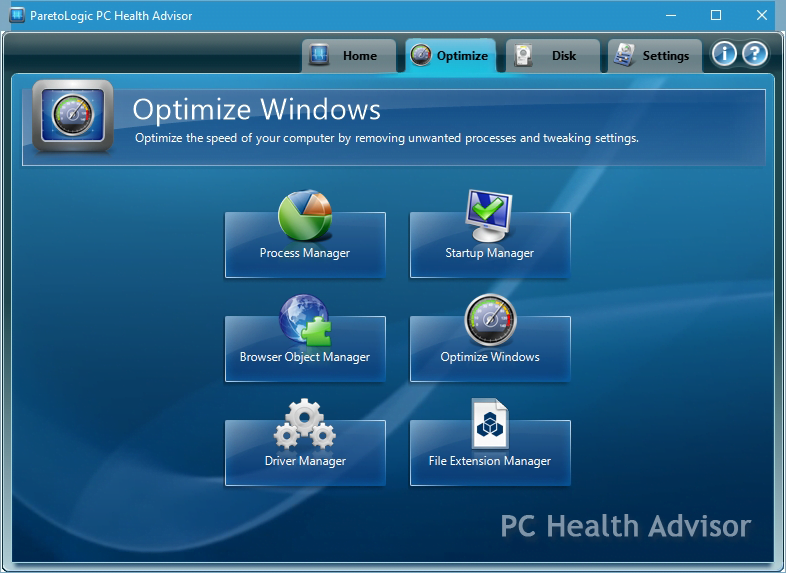 Besides the availability of advanced Windows diagnostics and optimization options, an obvious benefit of using this suite is that all of these features are brought together in one place. Furthermore, the efficient malware detection feature and the option to easily terminate persistent malicious processes are clearly on the plus side of the suite. A disadvantage, though, is that there is no actual fix functionality in the free version, which is restricted to only scanning and reporting. It would be great if the vendor provided a fully-functional free trial for at least a short time span. But overall, when it comes to ensuring smooth PC performance and security, this program can make your day.